With its location in the Summit View Resort, you know Patches Cabin offers more than convenient access to downtown Pigeon Forge. This 10-person rental with more than 2,000 square feet of space also features amazing mountain views from an open-air balcony, a lower-level rocking chair porch, and a wall of windows in the master bedroom. Enjoy the view at Patches Cabin, along with tons of entertaining amenities for your small group. You’ll have a game room with a pool table and flatscreen TV, an outdoor hot tub, and a catch-and-release pond located inside the resort. Also, Patches Cabin is only 6 miles from downtown Pigeon Forge, where you’ll find tons of family-friendly attractions like the Dolly Parton's Stampede and the Hollywood Wax Museum. 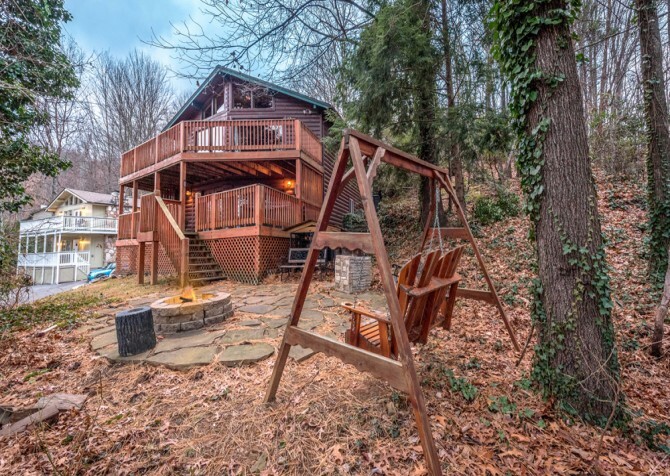 Bring the family and spread out among this cabin’s 4 bedrooms and 3 bathrooms, or plan a trip to Pigeon Forge with a small group of friends. Either way, you’ll love your time in the Smoky Mountains at Patches Cabin! 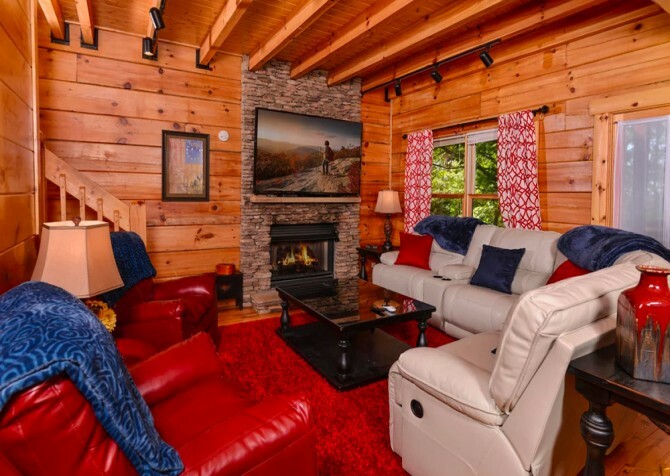 The living room inside Patches Cabin is the perfect place to hang out with friends and family during your Smoky Mountain retreat. Enjoy the big screen TV found in this space, where you can catch your favorite nightly TV shows and the early morning news. Sit back on the leather couch or the matching recliner to catch some ZZZs in the afternoon or curl up with a new book. You’ll also find a wooden rocker and a rustic coffee table that’s just the right size for your steaming cup of Joe first thing in the morning. If you’re planning a visit in the late fall or winter, turn on your gas fireplace for a cozy night inside the cabin after returning from outdoor adventures in the Great Smoky Mountains National Park. However you use it, you’ll love the large open-concept living room inside Patches Cabin! If you’re looking for a way to save money during your Smoky Mountain getaway, take advantage of the full-size kitchens in our Pigeon Forge rentals, including Patches Cabin! 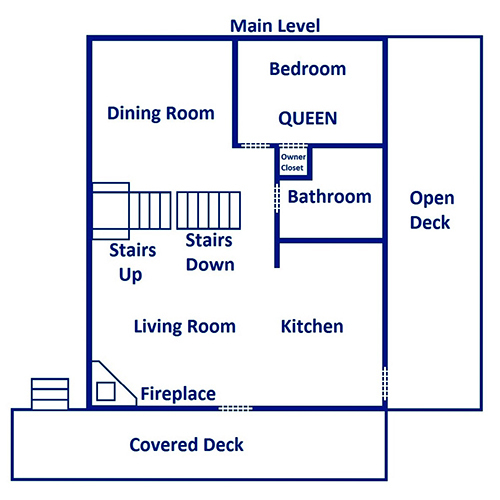 This cabin features an open-concept, L-shaped kitchen with all your major appliances in black. The full-size refrigerator is convenient for storing drinks and leftovers from downtown restaurants on the days you do decide to eat out. The electric stove and oven are perfect for breakfast casseroles, big pots of soup, or fresh-baked goodies in the evenings. A dishwasher, over-the-range microwave, coffeemaker, and toaster round out the convenient options inside this Pigeon Forge cabin. On the counter and in the cabinets, you’ll also find cutlery and serving pieces for a delicious meal with the family during your Smoky Mountain stay. When it’s time to enjoy that homemade meal you’ve prepared, head to the formal dining room inside Patches Cabin. Set away from the kitchen and living room, you’ll love the ambiance of this dining space with its sturdy wooden table and black leather chairs. Comfortably fit 4 to 6 guests around this modern, elegant dining table, and if you need more space, feel free to use the 4-piece breakfast table in the kitchen (ideal for kids) or the picnic table on the porch for guests who don’t mind eating outside. They might even prefer to eat outside thanks to this cabin’s amazing mountain views! Need a hangout space for the kids? For teenagers? For the kids at heart? Look no further than the game room inside Patches Cabins! On a rainy day, you can play a round on the pool table inside this cozy space. Flip on the flatscreen for ball games, movies, or shows while you play. Or you can play a board game or a game of cards on the 4-piece wooden table in the corner. This game room even has a mini fridge for your convenience, where you can store all your favorite drinks for your breaks between shots. 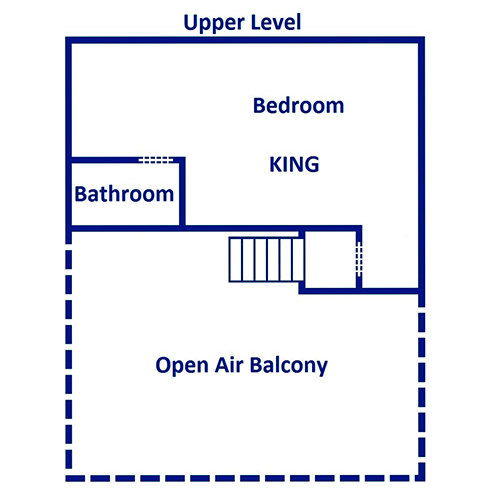 And if you need some fresh air, step onto the porch thanks to this room’s direct porch access. This game room is full of options for family-friendly fun! Plan a getaway with the family or with a small group of friends at Patches Cabin. Everyone will have room to spread out in this cabin’s 2,000-plus square feet of space, which offers 4 bedrooms and 3 bathrooms for your convenience. The master bedroom features a king-size bed with a line of windows offering gorgeous mountain views. This room also features an indoor jetted tub, perfect for relaxing sore muscles after hiking in the park. 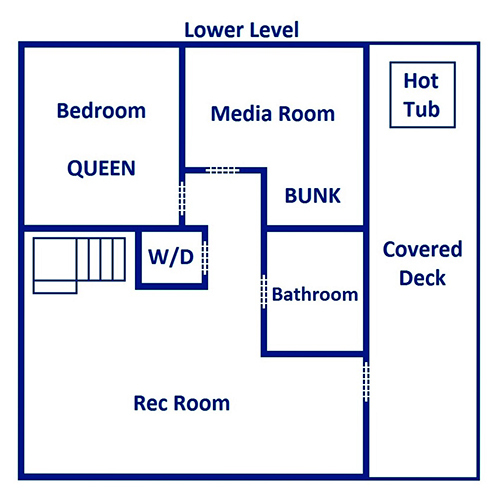 Two other bedrooms provide queen-size beds, and the final bedroom provides a sleeper sofa and a twin bunk—great for kids! Enjoy log-style furniture and individual TVs in each bedroom, along with convenient add-ons like ceiling fans, reading lamps, and nightstands. 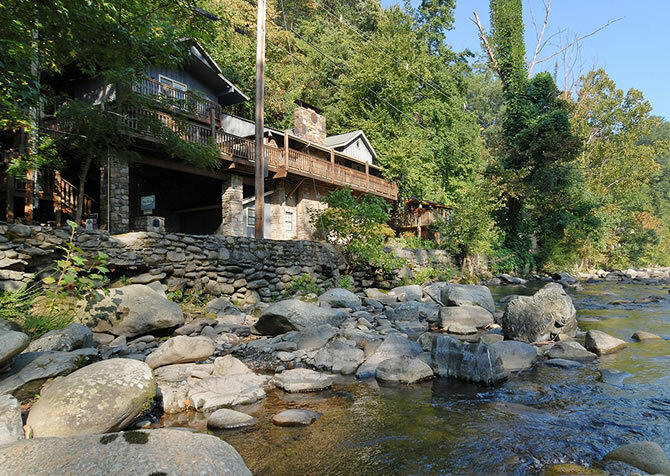 The outdoor spaces of Patches Cabin are what a trip to the Smokies is all about! Enjoy sweeping mountain views from your covered porch or climb up to the open-air balcony, where you’ll find a charcoal grill and rocking chairs with an end table between. If you’re looking for a place to melt away stress while you soak up the sights, try a dip in your outdoor hot tub provided by Patches Cabin. If you’re looking for a relaxing way to spend the afternoon with your family, head to the catch-and-release pond inside the Summit View Resort. The outdoor space of Patches Cabin also provides a swinging bench and a picnic table, both of which offer gorgeous views of the Smoky Mountains. 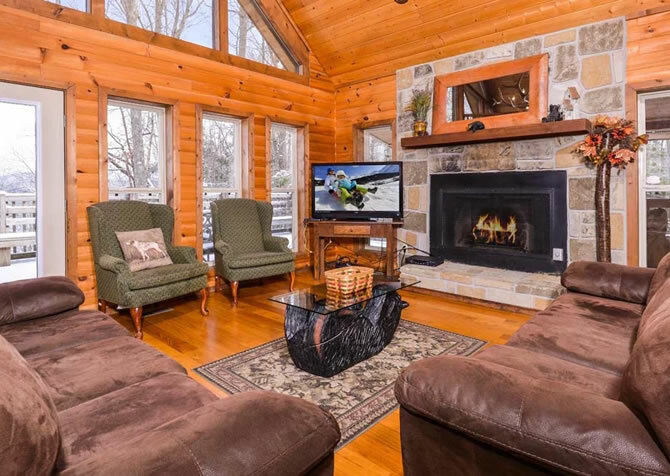 Along with a gas fireplace, big screen TV, outdoor hot tub, indoor jetted tub, and more, Patches Cabin provides wireless internet access to all its guests. This means you can stay in touch with our Cabins for YOU blog while you’re visiting the Smokies, and we’ll keep you in the know about upcoming events and the hottest new attractions. Patches Cabin also provides access to a washer and dryer, so you can stay on top of laundry after hiking, biking, or horseback riding in the Smokies. Finally, at Patches Cabin you’ll find a flat, paved driveway with room for 3-plus car. What better way to see the Smokies than by flying through the trees on an exciting ride? The pros at Smoky Mountain Ziplines will have you laughing and getting your adrenaline pumping! Spend a relaxing day tubing down the Little Pigeon River with the affordable and always popular attraction known as River Romp. A classic Pigeon Forge dinner theater, Dolly Parton's Stampede has been entertaining guests with its show horses and riders for years!